Counting on a Host Machine / Virtual Machine (VM) for installing Linux. (VMWare, VirtualBox, Parallels, or any other you can think of). Install Linux in this machine. This tutorial has been tested for Linux Ubuntu 10.10, 11.10 and 12.04, but should be valid for any other distribution (as long as the packages and SDKs we are mentioning here can be successfully installed). Please notice that the OS must be 64-bit in order to compile the Android system. We need to assign at least 4GB of RAM to our VM. 6tGB or higher is recommended for compiling the Android system. Now, we are going to set up our system! The original source -and therefore where you can get more info- is the Android Open Source Project webpage (here). Once this is done, the lower layer of our environment is set up. Now we need two more things: (i) a Cross Compiler and (ii) the actual Android SDK. First, a little reminder: This tutorial is not about developing for Android in terms of Apps. It is about developing for what is UNDER the Android System – which obviously will have an impact on the Apps running on top of it. This said, when we have a piece of code we want to compile, first we need to now the platform this code is intended to run in .This platform is commonly known as the Target Platform. As for the machine we use for developing/compiling the code that ought to be run in the Target Platform, it is commonly known as Host Machine. The Linux Ubuntu 64-bit machine we have just set up with all the packages above is indeed, our Host Machine. Each Target Platform needs a different cross compiler, so, based on the embedded system we are planing to develop for, we need to decide which Cross Compiler we use. In our case, we are going to use ARM based processors to run Android, and our choice will be Code Sourcery. Even here, there are several possibilities. 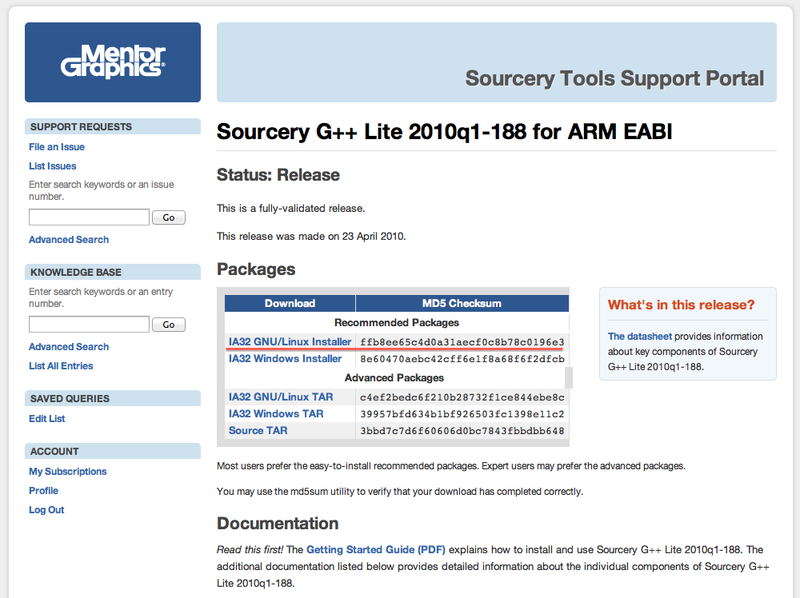 For now, we are going to use the Sourcery G++ Lite 2010q1-188 for ARM EABI (arm-none-eabi-). Download here. Please note that you would need to create a free account. After this you should select the IA32 GNY/Linux Installer. More information regarding the Sourcery G++ Lite ARM EABI can be found here. Save the changes and exit. After this, we allow all users to access the USB devices. (Note that you can be more restrictive if you want to). Please note that, if you are using a VM, sometimes you would need to mount the USB on it so that you can access it from you Linux. Refer to the documentation of your VM for this. As with any other SDK, the Android SDK requires/works-better-and-is-easier an development environment. In our case we will use Eclipse. Note that while Installing Software a warning message regarding unsigned content will pop up. Click OK and the installation will continue. Select “Install new SDK” and check the two boxes below it. Cross Compile code for ARM-based processors, on top of which Android will sit on. This entry was posted in Android System Development and tagged Android, Android Development, ODROID. Bookmark the permalink.